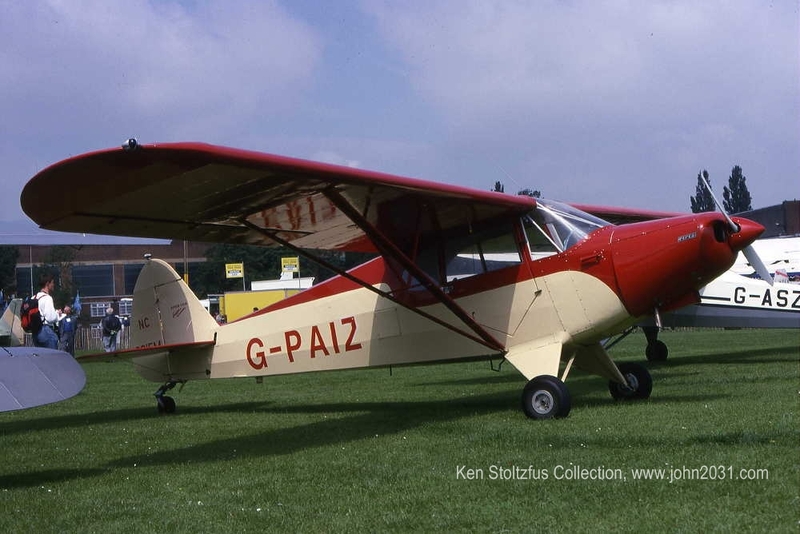 Piper PA-12 Super Cruiser pictures and information. Piper PA-12 Super Cruiser N92700 at Johnson Airport, Nikiski, AK, 4-11. 1946. 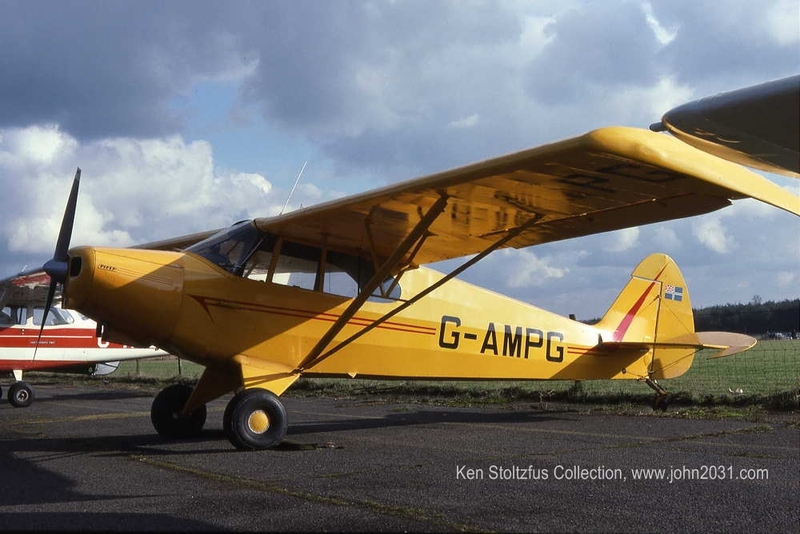 This PA-12 with those hunkin' big tires, gun cases, belly pod and modified door shouts "Bear hunter" to me. 1946 Piper PA-12 Super Cruiser N98906 at PAMR Merrill Field, Anchorage, AK 4-11. Piper PA-12 Super Cruiser N7571H, with a seaplane door, and on a "take me to the water" dolly, at PALH Lake Hood, Anchorage, AK 5-10. Piper PA-12 Super Cruiser N7844H, named "Moneyburner," on the ramp at Z41, Lake Hood Strip, Anchorge, AK 4-11. Probably that's true but it's certainly one of the funist ways to spend it! Piper PA-12 Super Cruiser N7856H at PALH Lake Hood, Anchorage, AK 5-10. The ice behind it will be gone soon. Piper PA-12 Super Cruiser N344W, ex N7872H, at PAMR Merrill Field, Anchorage, AK 7-04 The cowling says "Super Cruiser 150" so it obviously has an O-320. Piper PA-12 Super Cruiser N7931H at Z41 Lake Hood Strip, Anchorage, AK 5-10 and again in 4-11. Piper PA-12 Super Cruiser N7958H, O-320, at PALH Lake Hood, Anchorage, AK 5-10, waiting for the crane, to put those floats on, and again in 4-11. Piper PA-12 Super Cruiser N2514M with a retro cowl, wing tips and rudder, plus vortex generators, at PASX, Soldotna, AK 4-08. Somehow those tires, which are even smaller than the original 8:00x4's, look really really whimpy! Piper PA-12 Super Cruiser N2551M, O-320, pretty - real pretty - at Z41 Lake Hood Strip, Anchorage, AK 5-10. I saw it again in 4-11 and something about it said, "Honest Mom, I didn't see the puddle." It looks like it has a top hinged emergency exit on the left side instead of a seaplane door like some have. Some guys get to have ALL the fun! Photo 3. Piper PA-12 Super Cruiser N2656M at Z41 Lake Hood Strip, 5-10. Well protected - and hard to a good photo of in that black! Piper PA-12 Super Cruiser N2556M sitting with it's tail to the water at PALH Lake Hood, 5-10, a few days before the ice went out. 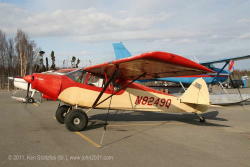 Piper PA-12 Super Cruiser N2736M at PALH Lake Hood, 4-08. Spring has sprung and soon the ice will be gone. Piper PA-12 Super Cruiser N2785M, very Alaskan! 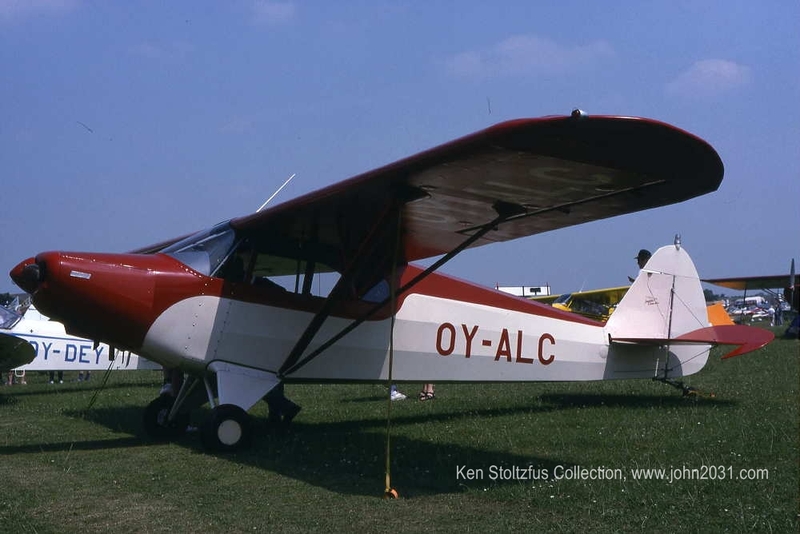 Lycoming O-320. At Soldotna, AK, 4-11. He'd be easy to find if he had a forced landing in the snow somewhere! Photo 2. 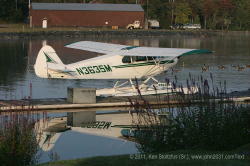 Piper PA-12 Super Cruiser N2914M with splates, on the edge of the water at PALH Lake Hood, 5-10. 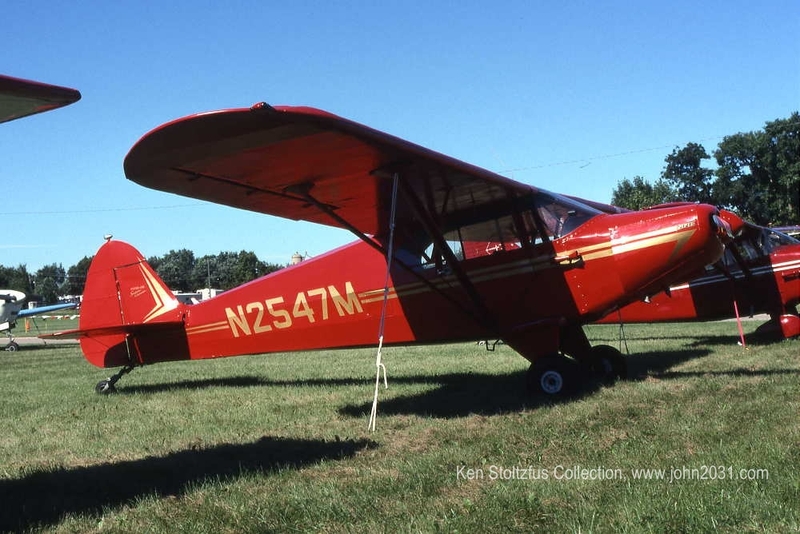 It has a Lycoming O-360. Piper PA-12 Super Cruiser floatplane N2318M at PALH Lake Hood, 7-04, poor light but I couldn't resist. Piper PA-12 Super Cruiser N2997M, O-320, on skies on PALH Lake Hood, 4-08. This photo shouts "Alaska!" Piper PA-12 Super Cruiser N2328M, a solid-looking, non-dramatic PA-12 on the edge of Lake Hood, 4-11. 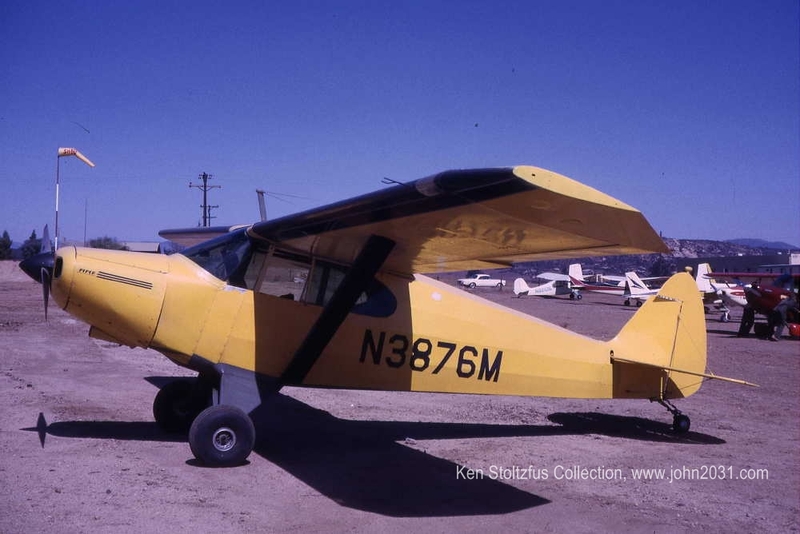 Piper PA-12 Super Cruiser N2344M, at Willow, AK 4-11. It's not far from stock. Piper PA-12 Super Cruiser N2324M, O-360, at PALH 7-04. Note the splates, and engine cowl. 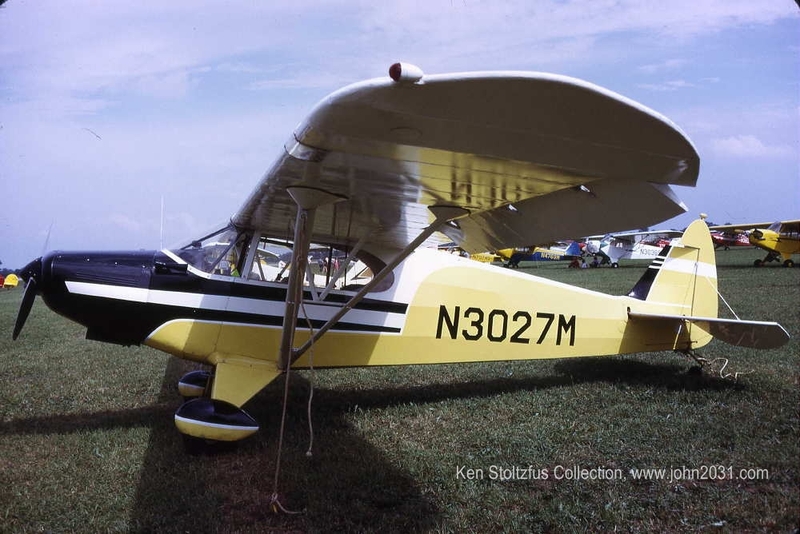 Piper PA-12 Super Cruiser N3027M, an Oshkosh 1972 slide. What does it look like now? 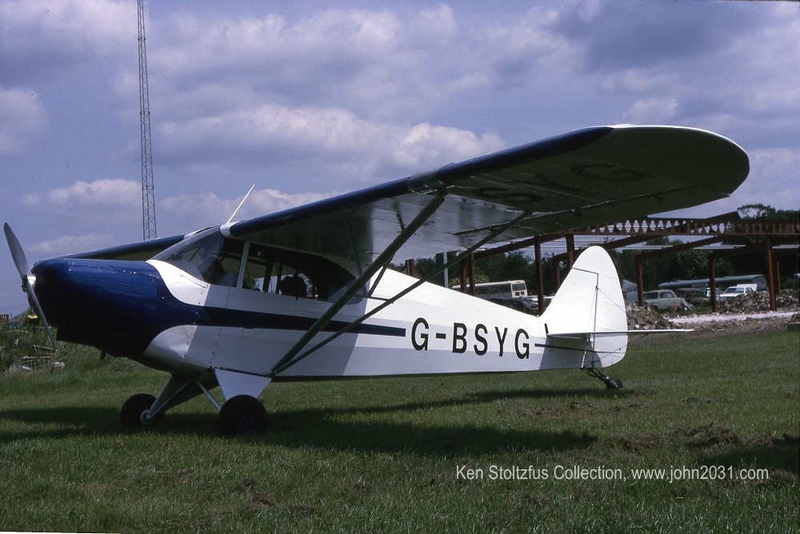 1947 Piper PA-12 Super Cruiser N3134M.. Pretty, and lots of mods including extended and squared off wings; a new rudder; cargo pod; VG's; oversized tires and probably 180-hp in place of the original 108-hp! At Talkeetna, AK 4-11. Piper PA-12 Super Cruiser N78CW with an O-320, on the edge of Lake Hood, Anchorage, AK 4-11, beside Piper Super Cub N4410E PA-18-150 cn 18-8109038. Piper PA-12 Super Cruiser N3658R, on display during the 2011 aviation trade show put on by the Alaska Airmen's Association each year. It's a wonderful show. Piper PA-12 Super Cruiser N3676N at PABV Birchwood, AK 5-10. Note "November" instead of "Mike" in the registration. There was a series of them around that sn. Here is a 4-11 shot showing the nifty step/tire cover that some of the guys use. Piper PA-12 Super Cruiser N78480 with the marks of steriod use, at Z41 Lake Hood, 5-10. It looks like they have the battery mounted pretty far back in the fuselage. And here's a 4-11 shot from the other side. 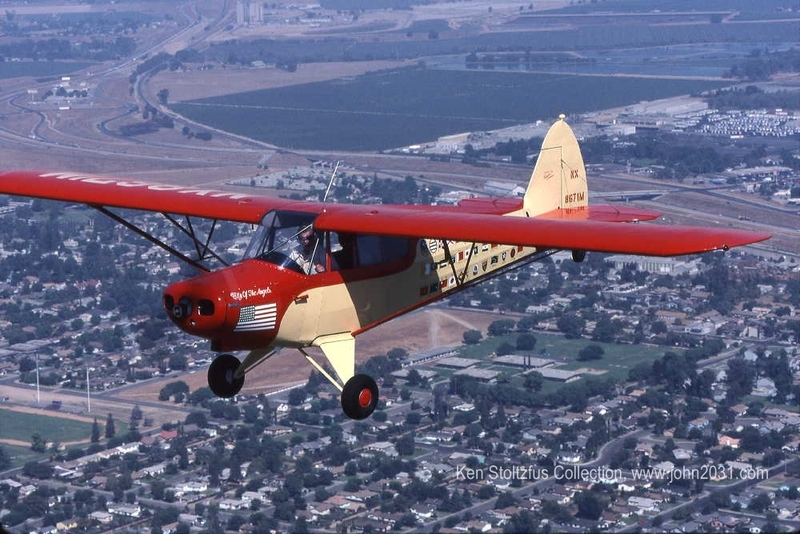 Piper PA-12 Super Cruiser N10603, slide at Van Nuys 10-72, now N1SE. Maybe it was supposed to look like an HE-1 or AE-1. Piper PA-12 Super Cruiser N3229M, propless and well-secured on the edge of PALH, Lake Hood, Anchorage, AK, 4-11. Piper PA-12 Super Cruiser N3297M landing at 64I, Lee Bottom Airport for the Wood, Fabric and Tailwheel Fly-in, 9-07. I saw 10 aircraft on final at once and I guess this guy thought it was a good idea to get on the ground and out of the way! Piper PA-12 Super Cruiser N3406M on the edge of PALH Lake Hood, 4-08, waiting for the ice to go away and the fun to begin. Piper PA-12 Super Cruiser N3409M, with O-320, at Z41 Lake Hood Strip, Anchorage, AK 5-10. It looks more like a tool for the trade than a toy - but "work" is a good thing! Piper PA-12 Super Cruiser N3615M, Lycoming O-320, on the ramp at Anchorage, 4-11. Piper PA-12 Super Cruiser N3557M. 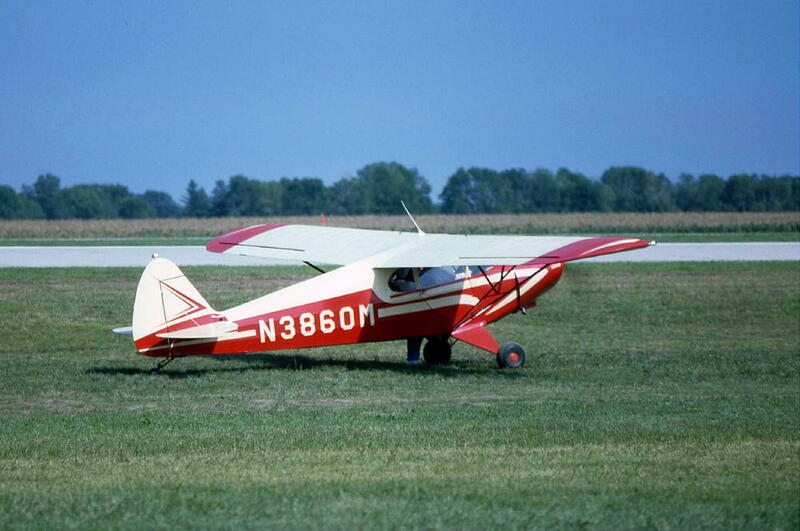 My son Ken Jr. bought it from the Arkansas CAP in 1979, flew it to Ohio, and resold it. He passed away in July 2011 following emergency surgery for brain tumors. Piper PA-12 Super Cruiser N3677M, O-320, belly tank, at Z41 Lake Hood Strip, 5-10, and from the left side in 4-11. Nice! Piper PA-12 Super Cruiser N3669M with floats nearby, at Z41 Lake Hood Strip, 5-10. 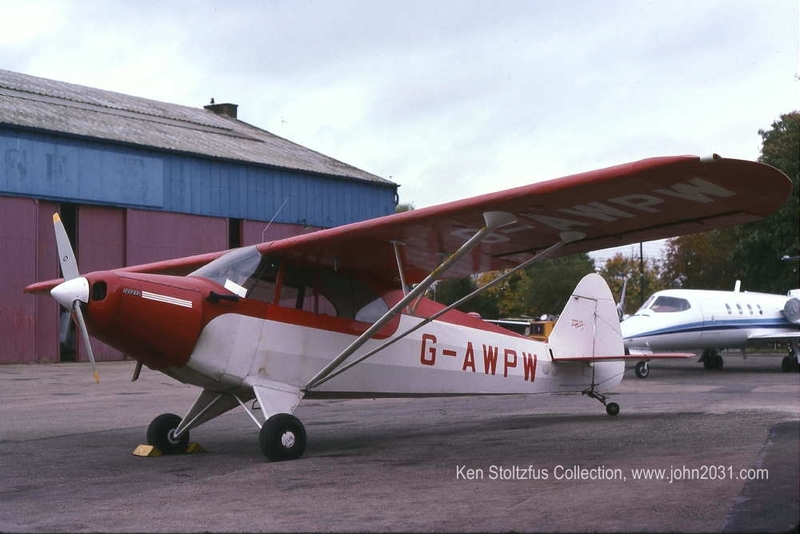 In 4-11 it was on the ramp with skies which were "out of season" by that time..
Piper PA-12 Super Cruiser N8671M, 'City of the Angels', slide 10-99. Piper PA-12 Super Cruiser N3680M, with seaplane door, belly tank and more.at Soldotna, AK 4-11. I owned this one in 1973-74 when I lived in VA. I sold it to my friend Bob Shenk. it. It was mostly red and he took it apart and refinished it. He made it mostly white and when it almost done he decided to add some retarder to the last coat, to get more gloss. It went through the white and pulled the red out and he had a pink PA-12! Okay - back to the scotchbrite, and no retarder this time! It was stock in every way at that time but things have obviously changed! 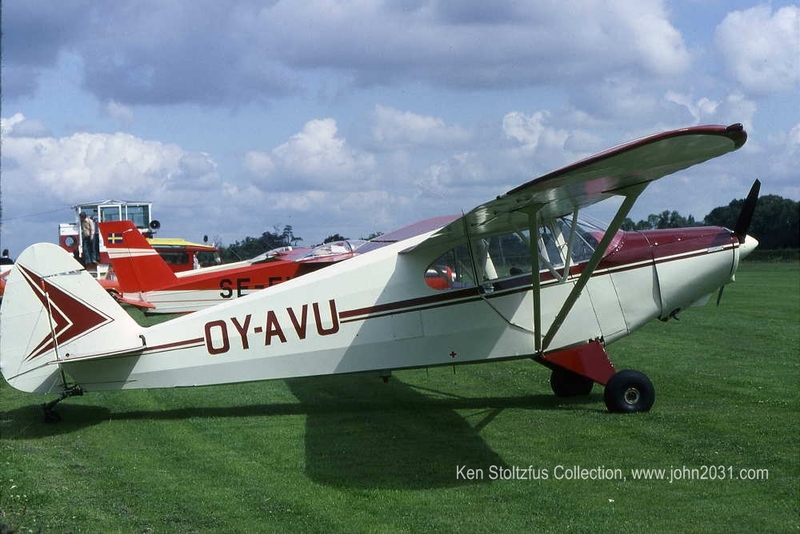 Piper PA-12 Super Cruiser N27DS with an L-21 type greenhouse, at PAMR Merrill Field, Anchorage, AK 7-04. Photos 2 - - - and 3. 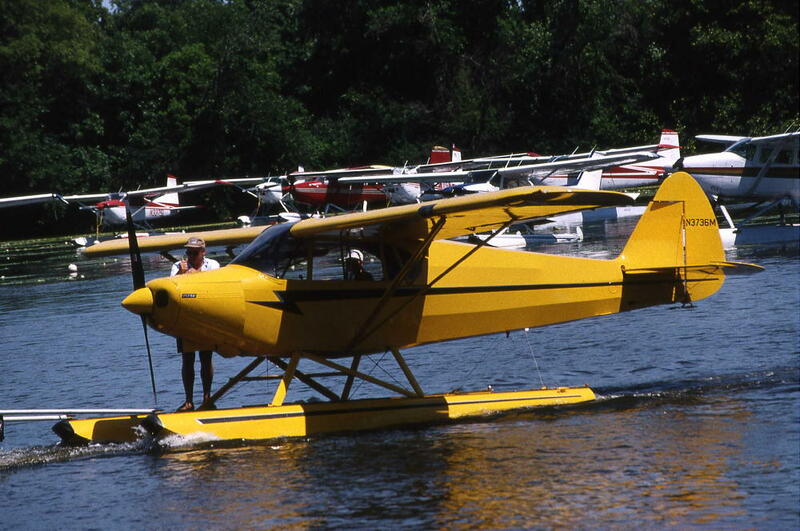 Piper PA-12 Super Cruiser N3736M, on floats, under tow at Oshkosh 1997. A slide from my collection. Piper PA-12 Super Cruiser N3882M, with splates and a modified rudder, at Z41 Lake Hood Strip 4-08. Iaw it again in 4-11 with big covers over those expensive tundra tires. Piper PA-12 Super Cruiser N7Z looking quite stock except for the 6" wheels, at PASX Soldotna, AK 4-08. No flaps, which is unusual for an Alaskan PA-12, but I can't tell if it has balanced elevators. Piper PA-12 Super Cruiser N3876M, a real oddity with a metalized wing and single strut. Probably in CA, 10-65 slide. Any help out there with info on this one? Piper PA-12 Super Cruiser N4017M with covers over those big, expensive, low pressure tires, at Z41Lake Hood Strip 5-10. Here's a shot from the left side in 4-11. Piper PA-12 Super Cruiser N4076M with very serious wing tips, at PAWS Wasilla, AK 5-10. Piper PA-12 Super Cruiser N4017M on the ramp at Z41, Anchorage, AK 4-11. Piper PA-12 Super Cruiser N4126M waiting patiently at Z41 Lake Hood Strip, 5-10, and 4-11, waiting for an engine. Piper PA-12 Super Cruiser N4142M, a beautifully restored PA-12 at 64I Lee Bottom Airport, Hanover, IN 9-10, Photos 2, and 3, and 4. Piper PA-12 Super Cruiser N4188M on the edge of Lake Hood, Anchorage, AK, 5-10. Before long the skies will be off and the floats on! Piper PA-12 Super Cruiser N4252M, at Z41 Lake Hood Strip 4-11. Fairly original looking in original trim lines but not quite the colors, and with just a little touch of "Alaska"
Piper PA-12 Super Cruiser N8249Q with original paint lines and colors, O-320, at Z41 Lake Hood Strip, 5-10. I saw it again in 4-11. Piper PA-12 Super Cruiser N4300M at PALH Lake Hood, 4-08. Looks like a recover job, and "It's time to fly, we'll do the rest later." Piper PA-12 Super Cruiser N4303M at PALH Lake Hood 4-08. It made the Preferred Airparts' calendar. And then again on the ice in 4-11. It'll be off the ice soon! 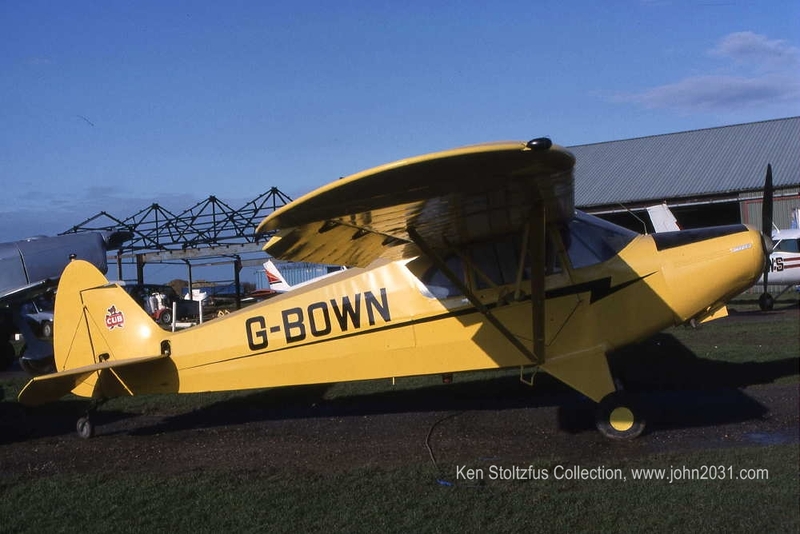 Piper PA-12 Super Cruiser N4431M at PAWD Seward, AK 7-04. The FAA Register says "150 Franklin." Is that true? Piper PA-12 Super Cruiser N4451M, a patriotic Piper at Z41 Lake Hood Strip, Anchorage, AK 5-10. It has a seaplane door. 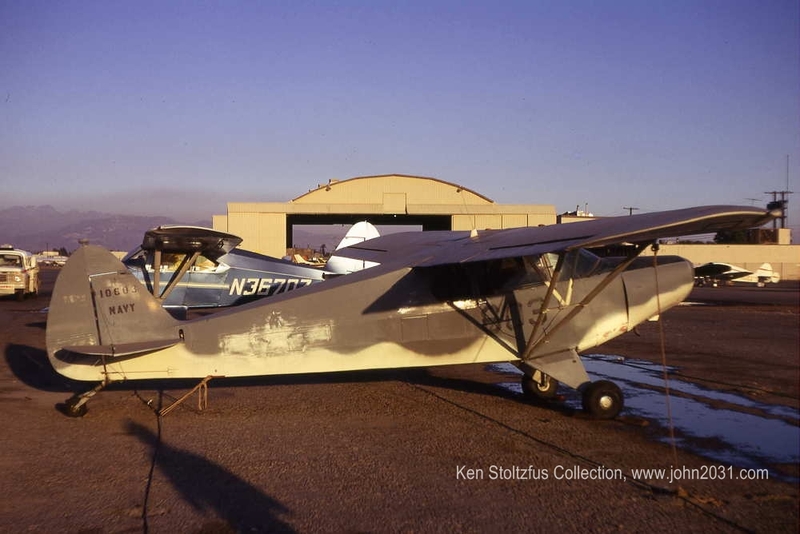 Piper PA-12 Super Cruiser N4080H with belly tank, splates and more, at Z41 Lake Hood, 5-10, and from the other side in 4-11. Piper PA-12 Super Cruiser N78564, with O-320, at PAMR Merrill Field, Anchorage, AK 7-04. AND THEN - - I saw it down at Soldotna in 4-11. It was literally transformed! I don't know if it was just repainted or if it was totally redone but it sure looks different! It might illustrate "born again!" 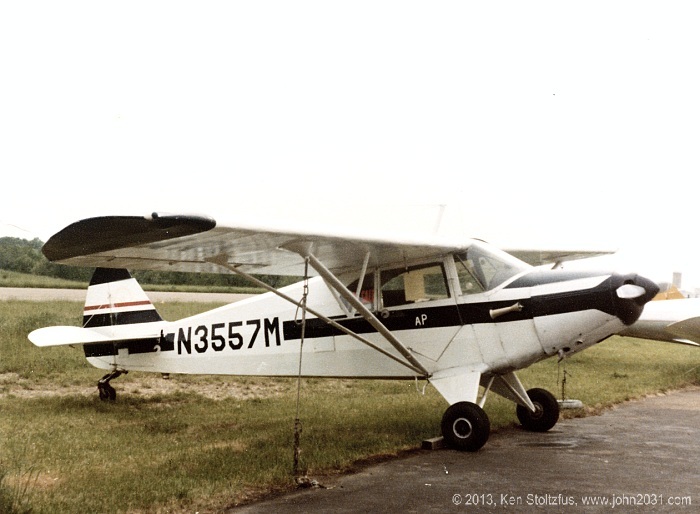 PA-12 "Experimental" N73AK with many mods including wing slats. Sometimes it's easier to go experimental than to try to get FAA approval on all that stuff. It's called a 'Custom Cruiser" and that it is. What a beauty and i suppose it's quite a performer. Probably a '360. Wow!! On the ramp at Z41, Lake Hood Strip, 4-11. Anybody know what 12- serial number it was built from, or was it scratch built? PA-12 at Lake Hood ANC AK 5-10. Oops - I didn't get the tail number on this pretty bird. I'll see if its there next time, but in the meantime, any help?